My son and I went back into the year 1910 yesterday. 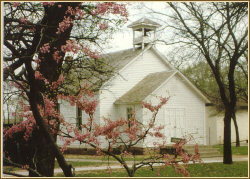 We went to Rose Hill, a one room schoolhouse. His class dressed the part and looked adorable! They had to wear authentic 1910 attire (long dresses, bonnets, braids, boys in flannel shirt or t-shirts, hats or suspenders). The School Marm remained in character the entire time The kids were terrified (I was too). ;) She lightened up a LITTLE towards the end. How long have you been a School Marm? Have you ever had difficulty controlling a class? No. If I married, they would fire me. It's not right for a woman to teach when she has a husband and household to care for. Do you enjoy your break when the children have recess and lunch? It was obvious this school marm liked her job. I enjoyed watching her. She had the kids in her grasp from the moment they lined up at her door (and the sponsors too). No one made a peep in that classroom! But the bus ride home was buzzing with stories from the day. More! We need more School Marms with that kind of control! That sounds like such a fun and instructional experience for everyone. I love your interview and that she stayed in character. What a fun experience that must have been. Is your son glad he wasn't born in the early 1900's? We had lots of discipline when I was in school but I wonder how I would have done with that Marm. Thanks for giving us a glimpse into the past. My own children have visited that museum too. On the day they went they had to pack little buckets with lunches that would be typical for that era. They thoroughly enjoyed it. Of course that was a few years ago. They are all out of college now and one teaches school...probably not quite like that school marm. Wow. Their lives were so much harder than ours. Yet we complain.